A second common mistake for managers is to assess team members by their ability to work with others on the team. That is, one with the most ability to get along and interact is the primary rating that is taken into account. For example, let’s say you have someone on your team with the unique ability to interact with others. They can do this very well, and having this positive influence is highly prized and appreciated. Thank goodness for having this person on the team! In valuing output and expertise, the only dimension being looked at is the “what” someone does. They have the ability to produce stuff that is important to the team. What is not being considered is the “how”—how well they work with the team and others outside the team in the process of this production or execution of their specialized skill. While the “what” is important, without positive interactions with the team (“how”), the value of what the person produces is severely diminished. In valuing “getting along well”, the only dimension being covered is the “how” someone does their work. They have the ability to interact well on the team, and this is important to the team. What is not being considered is the “what” the person produces—are they producing anything that provides a value to the team? While the “how” is important, without actually producing something that is of value to the team (“the what”), the value of how the person interacts is severely diminished. Using this grid, you can see when someone is actually above or below performance expectations. If they are above the diagonal line, then they are providing a net positive contribution. Below the line, it is a net negative contribution. 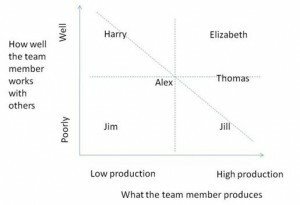 In the example above, only Thomas and Elizabeth are exceeding expectations, as they are plotted above the diagonal line. While Jill may be a high producer, her inability to work with the team needs to improve in order for her production to actually be used. Similarly, Harry, while well-liked by the team (as much as Elizabeth even! ), he isn’t producing anything, so he is not meeting expectations. He only has to increase his production somewhat to provide a net positive value to the team. As the manager, you can decide what slope and shape that above/below expectations line is. However, note that each individual must have a minimum ability in both dimensions to have value to the team. Here’s how you can plot the team on the graph. Think deeply about the people on your team and rate each person on a scale of 1 to 10 for “what” they produce, and “how” well they work with others (consider teammates and customers). Now that you have this plotted, you know who is meeting/exceeding expectations, and who is not. If they are below that diagonal line (a total score 11 or below), then they need to receive performance feedback as to what they need to improve on. Otherwise, they will self-rate and consider themselves the best performer on the team: “I’m the top producer, so I am the top performer” or “Everyone likes me, so I’m the top performer.” If you don’t provide feedback on both dimensions, you are setting yourself up for a toxic annual review. Also, if you have someone in the lower left quadrant, you should start actively performance managing that person. In my next blog entry, I’ll discuss how you can use this grid strategically to assign work and foster a high performing team. Do you provide feedback on both dimensions – the what and the how? How else have you seen this two-dimensional view used? You are right-on with your strategies for effective management. Failures of managers to manage effectively is due to lack of knowledge and training in management. So often mangers are unaware of alternative ways to manage–they are managing as they are managed, or have been managed. They think they are doing a good job following the only model they know–and think that if they survive the ‘toxic review’, they have been a good manager–it is just a part of the job. Your designs provide the crucial information necessary for managers to be effective in building a competent work force–a workforce that is productive and finds satisfaction, pride, and pleasure in their workplace–where they are always growing professionally.